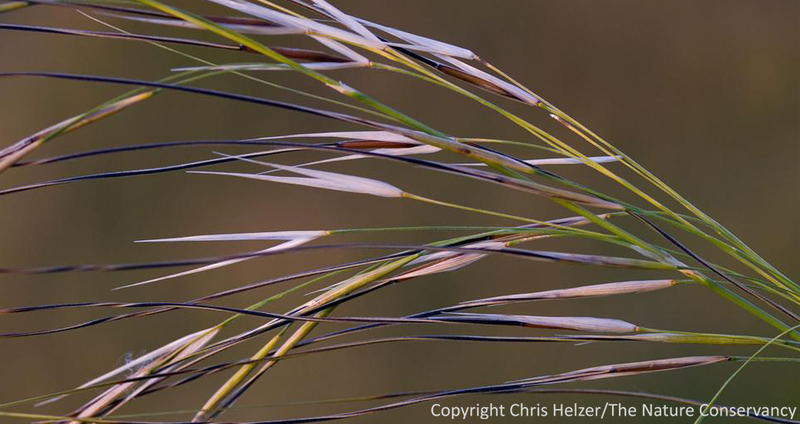 This photograph of porcupine grass was taken on the same June day as the larkspur photo above. This year, we’ll be harvesting porcupine seeds in the next couple of days, and it looks like much of it will have dropped by this weekend. Here’s a partial list of plants I’ve seen blooming as of Memorial Day (May 28) 2012. Some are a few weeks early, but others are much further ahead. From the little I know, and from what I can see, insects seem to be trying their best to keep up. The fruit trees in my yard are well-endowed with apples, pears, and cherries (we’re picking cherries a month early) so there must have been sufficient numbers of pollinators when those trees bloomed early. Over the weekend, we picked and ate wild mulberries on the way home from a fishing trip. Moths and butterflies that ordinarily migrate in the summertime were here in early May (or before). Even the ones that live here are confused. We saw several regal fritillaries last week that apparently pupated about a month early. I’m hoping those were isolated cases, because I’m not really ready to start butterfly surveys yet! 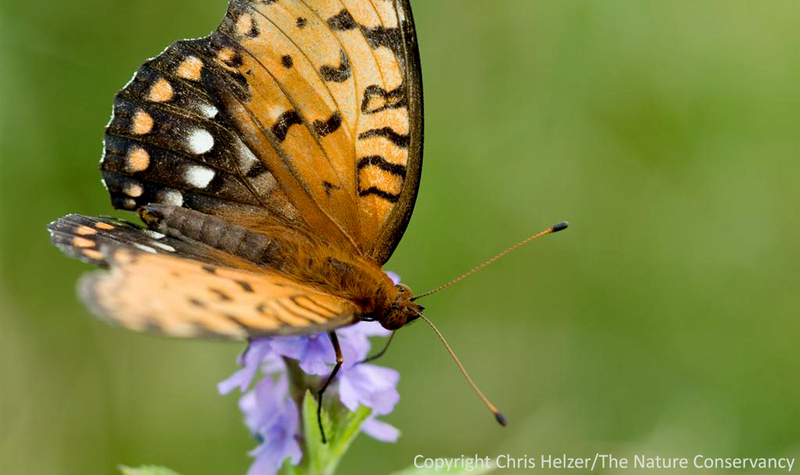 Regal fritillaries typically emerge in late June, but we’ve seen a fair number of males during the last week. It looks like we’re going to have to start our annual butterfly surveys about a month ahead of time. So to return to the initial topic, what’s going to happen later in the season if everything is this early now? Will each species flower for a longer period than usual? Will many plants bloom twice in the same year? If they rebloom, will their pollinators be around to pollinate them? I’ve got lots of questions, but not many answers. How about you? I’d also love to hear from others who have good examples of early flowering or other interesting observations. This entry was posted in General, Prairie Animals, Prairie Insects, Prairie Natural History, Prairie Photography, Prairie Plants and tagged 2012, climate change, early, global warming, phenology, plant flowering, warm spring, warm weather by Chris Helzer. Bookmark the permalink. Hey Chris – I saw three different plants of heath aster blooming in southeast Nebraska this weekend, each one just a little sprig with a few inflorescences. I also harvested (and planted) a good batch of porcupine grass. Chris, we can add Sorghastrum nutans and Salvia azurea at Konza Prairie to that list! With the heath aster, it is also not just a few isolated plants, but many. I also have New England aster, smooth blue aster, and meadow blazing star (L. ligulistylis) blooming in my back yard. You posted a picture of larkspur…here the seeds are already mature and dispersing! 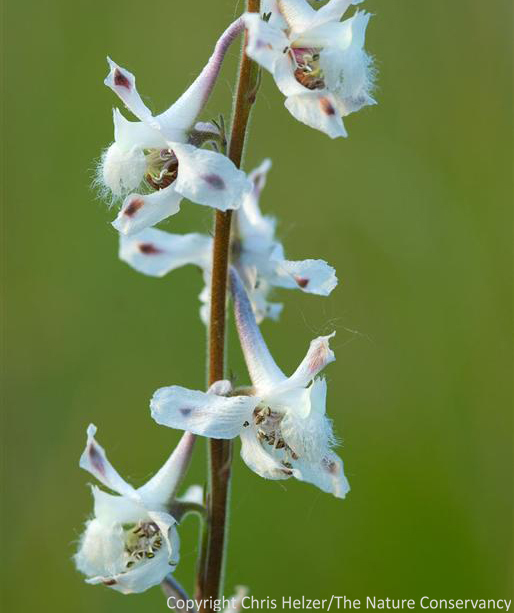 …and it was actually another graduate student here at Kansas State, Ben VanderWeide, that has been the first one to observe (and collect flowering herbarium specimens) for most of the species I told you about. One of my butterfly associates commented about fears of a “dearth” of blooms in late July for some of the common butterfy species due to the early bloom times of many plants this year. Insects and other animals of course have a way of adapting, but I wonder if this will change affect the range and numbers of some butterfly species. I had honey bees checking out my cracked corn feeders all winter long. If it was above 40 degrees they were there. I would give them lots of yummie alternitive feeding places but they allways stayed with the cracked corn. They would some times visit the water source I provided…but rarely. I am seeing the same things you are but I am also seeing longer flowering times…mabye a whole week or maybe two…. longer. I have of TONS AND TONS of violets this year and one of the fritillares is laying eggs….everywhere. I have suspended pulling violets in my gardens because I have lots and lots of catapillers! They are every where I look. I also have several kinds of bumble bees hanging out here. Would like to have some input from some one on that!!! If they are regal fritillary caterpillars, they will eat and then go into diapause. The regals overwinter as caterpillars. If you have lots of violets, keep them going even if you have lots of cats….they will compensate for the amount of food. In tall-grass prairies of the Midwest, the regals only have one flight.So the cats that are out there will be the butterflies for next year. Definitely the same here in North Carolina. The river oats have already set seed (!) the New England asters are blooming, the sundrops are in full force and will probably wrap soon, the mistflower and dwarf goldenrod are flowering waaaay ahead of schedule, and the various Agastaches are already in full swing. I’ve got a flower on the swamp sunflower, and that shouldn’t pop until late July! My black-eyed susans aren’t going yet, but the skullcap and daisy fleabane is going crazy and the beardstongue is already done. I’m also finding that my male and female deciduous holly, which did well for several years, are now flowering so far out of sync that I’m gonna have to bring in a stunt double. We had such a non-winter this year that the spring ephemerals really suffered, because a lot of my low perennials just never went dormant. I had to chop holes in the climbing aster so that the bloodroot could get a little sun, and annual sweet peas fried in the heat before they got more than a few inches long. We also had an hellish year for aphids–never seen anything like it. I suspect we may run short on some of the flowers, and while I can make up some of the slack in my garden with annuals, that’s a very small-scale solution. Fortunately some things, like mountain mint and some of the asters, seem to keep on trucking until the frost kills them–we even had asters in January last year! In Pittsburgh, Pennsylvania, our native form of Switchgrass is already blooming, at least a month early. The named P. virgatum varieties I have- Shenandoah, Heavy Metal, seem to be more on their normal schedule. It’s all quite odd. I have “Heavy Metal” in my garden in Manhattan, Kansas, and it has been blooming since last Friday. I germinate my seeds in flats outside. It is not just an unusual year for flowers, it is also an unusual year for germination. Some flats that did not germinate at all last year (and were held over) are germinating this year along with other flats of the same species which were sown this Spring. An example is Carex buxbaumii. I have things that grew fine last year that had no germination from seed sown this Spring. An example is Carex meadii. It is likely the Spring was not cold enough for a long enough period to stratify this species. Other species were well on there way by this time last year. This year these same species are just germinating. An example is Hypoxis hirsuta. The warm Spring probably resulted in a longer period before germination inhibitors were reduced to appropriate levels. My experiences this year are totally different, and in some instances the exact opposite, of last year. They are not reagles…and the cats here have been traped out. My challenge is the local birds!!!! I’ve seen a lot of mourning cloak butterflies in Lincoln. I’ve read that although they can be found across the country, they are relatively rarely observed. It is a real treat to see them. Any place in particular that you’re seeing mourning cloaks, Natalie? I’ve tried to raise them from larvae, but have only seen the butterfly once or twice. Their host is willow. I saw probabaly 25 morning clokes during the two weeks that lilacs were blooming in early March here in south central Nebraska…(Hastings Ne). They have dissapeared now, but In see them every year here in the spring.